We’re pleased to announce the imbrex Ambassador Program is now taking applications for Tier #1, the first of four to be launched in 2018. The imbrex Ambassador Program (IAP) is an opportunity for 40 enthusiastic community members to actively participate in the project’s expansion, by educating and onboarding imbrex early adopters in their local community. What does it take to be an imbrex Ambassador? First, and foremost, IAP candidates understand and support imbrex’s mission to create the first global, decentralized marketplace where users are in control of their data. You’re in it with us, as we envision and engineer a world of shared information, where buyers, landlords, agents and firms can realize the true value of their data. For the first tier, we’re looking for residential real estate industry veterans with an extensive local network, a basic understanding of blockchain technology, a passion for learning more about blockchain and about imbrex, as well as excellent communication skills. The IAP will consist of four Tiers in 2018. For each Tier, the imbrex team will select a total of ten ambassadors who will participate in two educational webinars on how imbrex works. Following successful completion of IAP education requirements, ambassadors will prepare for their Tier’s 30-day countdown to begin. During this time, each ambassador will have access to the alpha in order to better familiarize themselves with the platform. During the 30-day countdown, ambassadors will engage with their local community and onboard at least one residential real estate agency that meets the IAP Minimum Onboarding Requirements. Located within the United States. Executes Imbrex Participation Agreement (firm agrees to participate listings). Adds at least 10 listings to the imbrex platform. Listings are added by the listing agents, not the ambassador. Listing agents create individual user accounts. 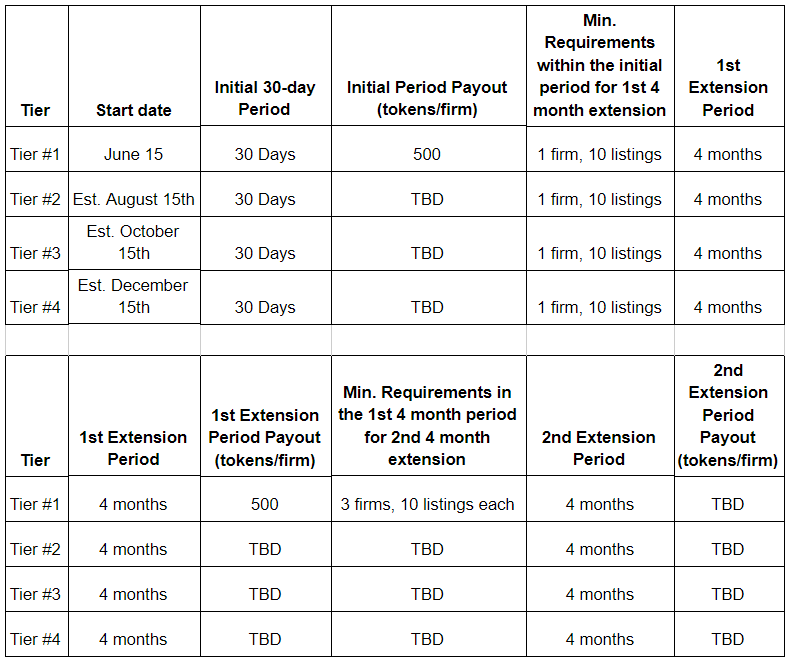 If the requirements are met within the initial 30-day period, the ambassador will be rewarded 500 IMBREX tokens, and secure his or her position as an imbrex Ambassador for an additional four-month period at the same payout rate of 500 IMBREX Tokens per each firm successfully onboarded. If an ambassador onboards three or more firms within the four-month extension period, s/he will secure the position and payout rate for an additional four-month period. What kind of firms should an ambassador sign on? Tier #1 will focus on residential real estate agencies, but we will eventually open up the ambassador program to include commercial firms as well. Agencies can range in size; there is no minimum or maximum number of agents required in a firm for onboarding. Firms can specialize in “For Sale” listings, “For Rent” listings, or a combination of both. The Ambassador Program is a great opportunity for those who are excited about imbrex and are driven to share its benefits with others. An announcement will be made once all of the ambassadors have been selected. We are excited to launch the Imbrex Ambassador Program as it gives us the first opportunity to work side-by-side with the community. We will continue to expand these relationships through spam curation and community voting mechanisms. Our long term objective is, and will always be, to have each market governed by the individual communities themselves. We look forward to hearing from you! Please send a short bio and synopsis on why you think you are a suitable candidate for the IAP. Feel free to attach links to social media accounts, blog posts or achievements you think will be helpful for the team to get to know you. All submissions should be sent to hello@imbrex.io by May 30, 2018. We will review all submissions and start the interviewing process by Monday June 4th. The team will select all ten Tier #1 ambassadors by June 14th.